Those of us who sat under Dr. McCune, whether at Central Seminary in Minneapolis or at Detroit Seminary, are glad that he is writing (my syllabus notes are getting old and tattered). Reviewing this volume, Dr. Larry Pettegrew writes, “Highlights include a presuppositional apologetic, a single source (Scripture) as the only rule for theology, cessationism of the miraculous gifts, pretribulational premillennialism in eschatology, a dispensational structure of God’s progressive revelation, a recent creationism, and a Calvinistic soteriology.” My years in seminary were greatly enhanced from sitting in Dr. McCune’s Dispensationalism, Kingdom, and New Evangelicalism classes, among various others. We may never find a theology book that describes us 100%, but Dr. McCune’s will rank as high as any. “It is assumed in the New Testament that a member of the body of Christ is also a member of a local church. 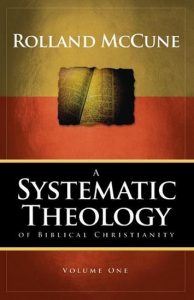 An unbaptized, unaffiliated Christian is unknown in the New Testament.” Rolland McCune, Systematic Theology, vol. III, p. 200.